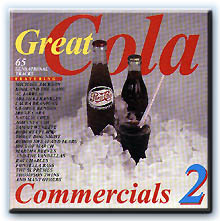 Another great import CD containing 65 rare 'Cola' commercials from the 1960s, 1970s and 1980s with Parodies of the top songs of the era, featuring Michael Jackson, The Three Dog Night, Johnny Cash, Tammy Wynette, The Hondells, Roberta Flack, Kool & the Gang, Al Jerreau, Laura Branigan, Aretha Franklin, Blood Sweat & Tears, Friends of Distinction, Al Green, Bread, The Carpenters, Chicago, Ray Charles, Nancy Sinatra, The Newbeats, Fontella Bass, The Treleloes, Loadstone, B.B. King, Patty Austin, B.J. Thomas, Ides of March, Martha Reeves & The Vandellas, Del Shannon, The Fortunes, Tommy James and The Shondells, The New Seekers, George Benson, Thompson Twins, Huey Lewis and many many more.